I think the price is right here to back OKC at home on Sunday against the 76ers. 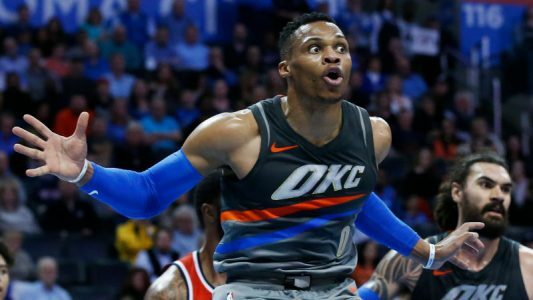 Now is the time to buy on the Thunder, who come in having won 7 straight. I just don’t think the books have adjusted to how much better they are playing and that was evident in yesterday’s line at Detroit, where they went off as a mere 3-point favorite against a Pistons team that had lost 6 straight. The injury to Andre Roberson is a big loss in the long run, but I don’t think it hurts them all that much here, especially at home, where there’s a good chance other role players will step up. 76ers have been playing well, but have caught some big breaks with opposing teams missing star players to injury and I think it has them getting a little to much respect here. Give me the Thunder -3.5! **#1 RANKED HANDICAPPER – 2017** Brandon Lee continues to build on his Massive 889-760 All-Sports Run that has his $1,000 Clients PROFITING $65,000 OVER L365+ DAYS! **–102-81 (56%) L55 DAYS & 195-152 (56%) RUN L96 DAYS–** It’s time you owned the books and started making some serious cash!